One of the world’s oldest cultures is known as Indus Valley civilization. A culture that was far more advanced than we give it credit today. For instance, 5,000 years ago they had cities built on a grid based system. A water distribution system to homes and most remarkably, a citywide sanitation system, world’s first, which allowed people to use the bathroom in their homes. The society was well ahead of its times, and thousands of years before Greeks or Romans had something similar. The remains of their cities can be found all over present day Pakistan. The most famous of them is Moenjodaro. A city worth rivaling the best ancient world left for us to wonder. The civilization also left behind remnants of their long forgotten language, the Indus Script. Today, scientists around the world are trying to use technology to resolve its mysteries and share with us what they said in those few tablets, seals and signposts that we have gathered. This video shows one such effort of how they are getting closer to an answer. It is one of the greatest language puzzles of all time and a Holy Grail of undecipherable scripts. That is the question which my digitally inclined friends and I are pondering. So at our home, we have painstakingly collected close to thousand book personal library. The collection is still growing as we speak as each week a new book is added from somewhere. These books are stored in nicely built custom wooden book shelves line the walls of our home including bedrooms. Yet, I have even more books in boxes stowed away in storage. Sadly some of them have to remain there till I find time and money to build more custom book shelves to house them. But now, with Kindle, iPad and other ereaders, the concept of a home library seems quaint, heavy and expensive. I can fit almost all of my books (they take up over 30+ cartons) of them and many more onto a book reader thinner than the Time Magazine that I get delivered each week. Or is it? I have my dad’s edition of Charles Dickens novels which themselves are over 50 years old. I have Shakespeare in a special hardbound collectors edition to share with friends. And oh, Homer’s Illiad and Newtons books in Great Books Americana edition. But Kindle have them too and they are all free (atleast at the time of writing this). Suddenly my multi-room, multi-shelf book collection can now be housed inside a magazine size Kindle. So is Kindle and iPad the future of book reading? What happens when Apple goes bust or Amazon no longer exists? What happens to my books bought through electronic medium for e-readers? Will they survive the decades ahead in digital form and can I pass them on to the next generation like my dad shared them with us? Can iPad books be still the thing to read in say 2030? Or will they be dead along with the technology that housed them? I can still read paperbacks that I bought during highschool (1980s era) without any trouble. Will that be true with an iPad? 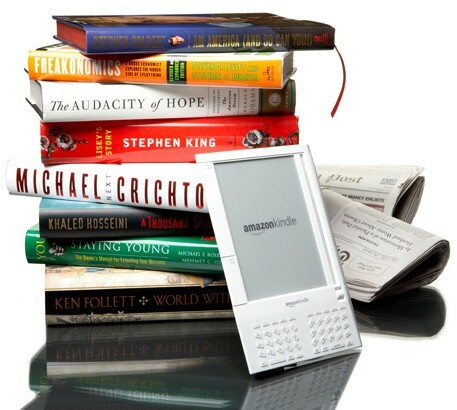 History of digital world tells us that we wont have a Kindle in 2030. Today’s “in” and “hot” technology will be lost, old fashioned and forgotten by that time. Does anyone remember Newton from Apple? The world’s first handheld PDA that died unceremoniously during Steve Jobs second coming. Does anyone remember a Palm PDA that once controlled 95% of all handheld market? Where is it now? And then, we went through the same crazy world with music. The LPs, cassettes, CDs all replaced and rebought in mp3 format. Yes, we all ended up buying again and again the same song after every so many years. And then the same happened with Videos. My Star Wars VHS collection no longer plays on modern players. Heck, I need to buy HD versions again just to keep the movie playable. Technology changed so fast that we lost information that we were unable to transfer to the next medium. Palm games and content is not necessarily available onan iPhone or Android phone. I do have my Atari (1982) still with me with the original Pacman, Space Invaders and Astroids. But Atari is defunct and those game cartridges are worthless and not playable on the current hardware. So the question really is will my books bought today be usable on a hardware 20 years later? This is a problem and we need a solution. A workable solution. The book readers from Apple, Amazon, Barnes and Noble need to agree on a common protocol to share content. The hardware should be independent of where the books were purchased from. In other words, if I buy something from Apple, it should be readable on Apple hardware or even Barnes and Noble or any other reader that uses the same protocol. Currently, a Kindle book is only readable on kindle (be it on ipad, PC or a kindle hardware). But a Kindle book should be readable on iBooks as well. And an ebook from iBooks should be readable on Barnes & Noble Nook. Without this collaboration, it is difficult for any serious book reader and collector to move to the digital world. So till then, I will prefer to buy paperbacks for all the great books that I find in the market and will only occasionally purchase ebooks as I want to pass on the library of books to the next generation to enjoy. The greatest comedian ever to have been born in South Asia (India, Pakistan and Bangladesh) played his last act today. Moin Akhter died today in Karachi, Pakistan when he suffered his second heart attack. He was 61. I still remember with fond memories, when as a kid, I used to hear audio tapes of stand up comedy acts of Moin Akhter. Even to an 7 year old, he was funny. Really funny. My mom would put on the tapes to amuse us all. Not just the kids, but even 70 year olds could not stop but laugh at his jokes. He was a big hit across the Indo-Pak subcontinent drawing in large audiences wherever he performed. Even some of his memorable jokes made their way into Bollywood cinema and acted in the films by the greats like Amitabachan and Dharmindara. He made it big on stage, as a stand up comedian traveling worldwide and entertaining people of all ages. His jokes were always family friendly and never crossed the border into what one may consider “Adult only” audience. He respected his peers and elders and encouraged youngsters to make a name for himself. Moin Akhter was a truly gifted person. And he used it to perfection in every field he worked. I share here a link to one of his memorable program on PTV in 1980s where we see him take on a banter with some of the greatest contemporaries of their time. Comedy cannot be the same without him. Now here is a neat little forum for the budding entrepreneurs. It is run and managed by Stanford Alum entrepreneurs and offers advice on “starting a business or running a small business” especially in these trying times. One man ad agency – how much should I charge? Do I need to incorporate if I am launching an iPhone App? The forum is unlike the usual forums. All the questions follow a flat hierarchy and are characterized by tags rather than topics. The most recent questions automatically pop to the top thus making it easier for users to read/answer them. You can also instantly vote for any question that you like. And of course, you can even subscribe to get an alert if someone answers your pertinent question. I enjoy this format much better over the typical boring mundane forums where everything is overly structured and answers are many levels deep. We love this forum so much that we have added a link to Explain Business on our blog. Yes, our readers can now ask questions directly on that forum and get an instant response back. So start asking your questions on Explain Business and let Stanford alum answer them for you. We all tend to go gaga over cool apps that are built for iPhone. But sometimes, in this all hoopla we forget that there is innovation and creativity going on beyond the Apple platform. And Nokia is no exception. Quite recently, I downloaded and started using a really cool app built for Nokia Symbian phones called Sports Tracker. Yeah, I do own a Nokia E71 device that AT&T sells in the US as the thinnest smart phone on the planet. But thankfully, I do not use AT&T and therefore I am not subject to confused pricing and often patchy service. Enough about AT&T and E71 as that can be discussed at another time. Nokia Sports Tracker, uses the built-in GPS to keep track of our outdoor activities (walking, hiking, running, cycling, ski etc) through the touch of a button. It not only tracks our speed, the distance and time but will also automatically upload this information to our training diary on line. And yes, you can share that information with friends and create a social network around it. It also rudimentary calculates your heart rate and calories burned. Nokia Sports tracker is cool as one does not need to install any special device (in your shoe for example) to use. It uses the built in GPS to track where you are what you are doing. Once you press “Start” a workout, it begins calculating information and tracking you on a map. The elevation above sea level (altitude), the speed of walking/cycling/running, the distance traveled, are all calculated in real time and stored in your phone. You can also share your workout live with friends as well (comes in handy if you are competing). In the past I used to try to keep track of my workouts using pen and paper. Now I use Nokia Tracker. So far, I love this app and hope to see more of such gems coming from Nokia in near future. >Here is a video I found online at the TED talks. It was shot 5 years ago this Februrary during the annual TED Conference in California. Here Sergey Brin and Larry Page talk about cool new products and services that are being rolled out by the Google Machine. Services like Adsense and Orkut among others. At the time of the the video being shot, Orkut had only 100,000 users and almost 60% from USA. It also talks about their concept of letting their employees spend 20% of the time building cool new apps including the just released Google News among others. The video is just five years old, yet it seems like a life time ago. In these preceding years, Google and its products have changed the way we use internet, transact and communicate with each other. It is amazing how the internet world has grown and changed around us these years and how technology is becoming more intertwined in our lives. >I cam across this list recently while surfing the web for some relevant content. Here is a list of 100 blogs on leadership ranging from, youth, gender and religious, development and management of leadership skills. Check it out, you might find something of interest in there. I know I did.